Someone types the word "dresses" and hits enter. What will be the very first result? There are, of course, a lot of possibilities. Macy's comes to mind. Maybe a specialty chain, like J. Crew or the Gap. Perhaps a Wikipedia entry on the history of hemlines. O.K., how about the word "bedding"? Bed Bath & Beyond seems a candidate. Or Wal-Mart, or perhaps the bedding section of Amazon.com. "Area rugs"? Crate & Barrel is a possibility. Home Depot, too, and Sears, Pier 1 or any of those Web sites with "area rug" in the name, like arearugs.com. The New York Times asked an expert in online search, Doug Pierce of Blue Fountain Media in New York, to study this question, as well as Penney's astoundingly strong search-term performance in recent months. What he found suggests that the digital age's most mundane act, the Google search, often represents layer upon layer of intrigue. And the intrigue starts in the sprawling, subterranean world of "black hat" optimization, the dark art of raising the profile of a Web site with methods that Google considers tantamount to cheating. Despite the cowboy outlaw connotations, black-hat services are not illegal, but trafficking in them risks the wrath of Google. The company draws a pretty thick line between techniques it considers deceptive and "white hat" approaches, which are offered by hundreds of consulting firms and are legitimate ways to increase a site's visibility. Penney's results were derived from methods on the wrong side of that line, says Mr. Pierce. He described the optimization as the most ambitious attempt to game Google's search results that he has ever seen. "Actually, it's the most ambitious attempt I've ever heard of," he said. "This whole thing just blew me away. Especially for such a major brand. You'd think they would have people around them that would know better." TO understand the strategy that kept J. C. Penney in the pole position for so many searches, you need to know how Web sites rise to the top of Google's results. We're talking, to be clear, about the "organic" results - in other words, the ones that are not paid advertisements. In deriving organic results, Google's algorithm takes into account dozens of criteria, many of which the company will not discuss. If you own a Web site, for instance, about Chinese cooking, your site's Google ranking will improve as other sites link to it. The more links to your site, especially those from other Chinese cooking-related sites, the higher your ranking. In a way, what Google is measuring is your site's popularity by polling the best-informed online fans of Chinese cooking and counting their links to your site as votes of approval. But even links that have nothing to do with Chinese cooking can bolster your profile if your site is barnacled with enough of them. And here's where the strategy that aided Penney comes in. Someone paid to have thousands of links placed on hundreds of sites scattered around the Web, all of which lead directly to JCPenney.com. The links do not bear any fingerprints, but nothing else about them was particularly subtle. Using an online tool called Open Site Explorer, Mr. Pierce found 2,015 pages with phrases like "casual dresses," "evening dresses," "little black dress" or "cocktail dress." Click on any of these phrases on any of these 2,015 pages, and you are bounced directly to the main page for dresses on JCPenney.com. Some of the 2,015 pages are on sites related, at least nominally, to clothing. But most are not. The phrase "black dresses" and a Penney link were tacked to the bottom of a site called nuclear.engineeringaddict.com. "Evening dresses" appeared on a site called casino-focus.com. "Cocktail dresses" showed up on bulgariapropertyportal.com. "Casual dresses" was on a site called elistofbanks.com. "Semi-formal dresses" was pasted, rather incongruously, on usclettermen.org. There are links to JCPenney.com's dresses page on sites about diseases, cameras, cars, dogs, aluminum sheets, travel, snoring, diamond drills, bathroom tiles, hotel furniture, online games, commodities, fishing, Adobe Flash, glass shower doors, jokes and dentists - and the list goes on. Some of these sites seem all but abandoned, except for the links. The greeting at myflhomebuyer.com sounds like the saddest fortune cookie ever: "Sorry, but you are looking for something that isn't here." Exploiting those hovels for links is a Google no-no. The company's guidelines warn against using tricks to improve search engine rankings, including what it refers to as "link schemes." The penalty for getting caught is a pair of virtual concrete shoes: the company sinks in Google's results. Often drastically. In 2006, Google announced that it had caught BMW using a black-hat strategy to bolster the company's German Web site, BMW.de. That site was temporarily given what the BBC at the time called "the death penalty," stating that it was "removed from search results." BMW acknowledged that it had set up "doorway pages," which exist just to attract search engines and then redirect traffic to a different site. The company at the time said it had no intention of deceiving users, adding "if Google says all doorway pages are illegal, we have to take this into consideration." J. C. Penney, it seems, will not suffer the same fate. But starting Wednesday, it was the subject of what Google calls "corrective action." "I can confirm that this violates our guidelines," said Mr. Cutts during an hourlong interview on Wednesday, after looking at a list of paid links to JCPenney.com. He said Google had detected previous guidelines violations related to JCPenney.com on three occasions, most recently last November. Each time, steps were taken that reduced Penney's search results - Mr. Cutts avoids the word "punished" - but Google did not later "circle back" to the company to see if it was still breaking the rules, he said. "Do I wish our system had detected things sooner? I do," he said. "But given the one billion queries that Google handles each day, I think we do an amazing job." Mr. Cutts sounded remarkably upbeat and unperturbed during this conversation, which was a surprise given that we were discussing a large, sustained effort to snooker his employer. Asked about his zenlike calm, he said the company strives not to act out of anger. You get the sense that Mr. Cutts and his colleagues are acutely aware of the singular power they wield as judge, jury and appeals panel, and they're eager to project an air of maturity and judiciousness. That said, he added, "I don't think I could do my job well if in some sense I was not offended by things that were bad for Google users." "Am I happy this happened?" he later asked. "Absolutely not. Is Google going to take strong corrective action? We absolutely will." And the company did. On Wednesday evening, Google began what it calls a "manual action" against Penney, essentially demotions specifically aimed at the company. At 7 p.m. Eastern time on Wednesday, J. C. Penney was still the No. 1 result for "Samsonite carry on luggage." At 7 p.m. on Wednesday, Penney was No. 1 in searches for "living room furniture." Penney also issued a statement: "We are disappointed that Google has reduced our rankings due to this matter," Ms. Brossart wrote, "but we will continue to work actively to retain our high natural search position." She added that while the collection of links surely brought in additional revenue, it was hardly a bonanza. 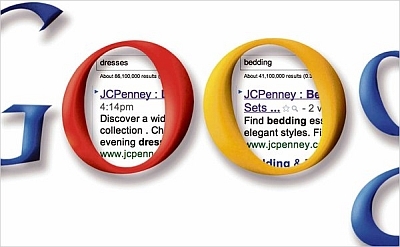 Just 7 percent of JCPenney.com's traffic comes from clicks on organic search results, she wrote. A far bigger source of profits this holiday season, she stated, came from partnerships with companies like Yahoo and Time Warner, from new mobile applications and from in-store kiosks. Search experts, however, say Penney likely reaped substantial rewards from the paid links. If you think of Google as the entrance to the planet's largest shopping center, the links helped Penney appear as though it was the first and most inviting spot in the mall, to millions and millions of online shoppers. How valuable was that? A study last May by Daniel Ruby of Chitika, an online advertising network of 100,000 sites, found that, on average, 34 percent of Google's traffic went to the No. 1 result, about twice the percentage that went to No. 2. The Keyword Estimator at Google puts the number of searches for "dresses" in the United States at 11.1 million a month, an average based on 12 months of data. So for "dresses" alone, Penney may have been attracting roughly 3.8 million visits every month it showed up as No. 1. Exactly how many of those visits translate into sales, and the size of each sale, only Penney would know. But in January, the company was crowing about its online holiday sales. Kate Coultas, a company spokeswoman, wrote to a reporter in January, "Internet sales through jcp.com posted strong growth in December, with significant increases in traffic and orders for the key holiday shopping periods of the week after Thanksgiving and the week before Christmas." Adding to the company's woes is the demise of its catalog business. Penney has phased out what it called its Big Book and poured money into its Web site. But so far, the loss of the catalog has not been offset by the expansion of the Web site. At its peak, the catalog brought in about $4 billion in revenue. In 2009, the site brought in $1.5 billion. "For the last 35 years, Penney has tried to be accepted as a department store, and during unusually good times, it does very well," said Bernard Sosnick, an analyst at Gilford Securities. "But in bad times, it gets punished by shoppers who pull back after having spent aspirationally." MANY owners of Web sites with Penney links seem to relish their unreachability. But there were exceptions, and they included cocaman.ch. ("Geekness - closer to the world" is the cryptic header atop the site.) It turned out to be owned and run by Corsin Camichel, a chatty 25-year-old I.T. security analyst in Switzerland. The word "dresses" appears in a small collection of links in the middle of a largely blank Cocaman page. Asked about that link, Mr. Camichel said his records show that it turned up on his site last April, though he said it might have been earlier than that. "You do pretty well," he wrote, referring to income from his links trading. "The thing is, the more you invest (time and money) the better results you get. Right now I get enough to buy myself new test devices for my Android apps (like $150/month) with zero effort. I have to do nothing. Ads just sit there and if people click, I make money." Interviewing a purveyor of black-hat services face-to-face was a considerable undertaking. They are a low-profile bunch. But a link-selling specialist named Mark Stevens - who says he had nothing to do with the Penney link effort - agreed to chat. He did so on the condition that his company not be named, a precaution he justified by recounting what happened when the company apparently angered Google a few months ago. "It was my fault," Mr. Stevens said. "I posted a job opening on a Stanford Engineering alumni mailing list, and mentioned the name of our company and a brief description of what we do. I think some Google employees saw it." "Literally, you typed the name of the company into the search box and we did not turn up. Anywhere. You'd find us if you knew our Web address. But in terms of search, we just disappeared." Mr. Stevens agreed to meet in mid-January for a dinner paid for by The Times. Asked to pick a "fine restaurant" in his neighborhood, he rather cheekily selected a modern French bistro in Palo Alto offering an eight-course prix fixe meal for $118. Liquid nitrogen and "fairy tale pumpkin" were two of the featured ingredients. "The key is to roll the campaign out slowly," he said as he nibbled at seared duck foie gras. "A lot of companies are in a rush. They want as many links as we can get them as fast as possible. But Google will spot that. It will flag a Web site that goes from zero links to a few hundred in a week." The hardest part about the link-selling business, he explained, is signing up deep-pocketed mainstream clients. Lots of them, it seems, are afraid they'll get caught. Another difficulty is finding quality sites to post links. Whoever set up the JCPenney.com campaign, he said, relied on some really low-rent, spammy sites - the kind with low PageRanks, as Google calls its patented measure of a site's quality. The higher the PageRank, the more "Google juice" a site offers others to which it is linked. "The sites that TNX uses mostly have low PageRanks," Mr. Stevens said. Publishers can reject certain keywords and links - Mr. Stevens said some balked at a lingerie link - but for the most part the system is on a kind of autopilot. A client pays Mr. Stevens and his colleagues for links, which are then farmed out to Web sites. Payment to publishers is handled via PayPal. You might expect Mr. Stevens to have a certain amount of contempt for Google, given that he spends his professional life finding ways to subvert it. But through the evening he mentioned a few times that he's in awe of the company, and the quality of its search engine. "I think we need to make a distinction between two different kinds of searches - informational and commercial," he said. "If you search â€˜cancer,' that's an informational search and on those, Google is amazing. But in commercial searches, Google's results are really polluted. My own personal experience says that the guy with the biggest S.E.O. budget always ranks the highest." To Mr. Stevens, S.E.O. is a game, and if you're not paying black hats, you are losing to rivals with fewer compunctions. "Spammers never stop," he said. Battling those spammers is a never-ending job, and one that he believes Google keeps getting better and better at. Here's another hypothesis, this one for the conspiracy-minded. Last year, Advertising Age obtained a Google document that listed some of its largest advertisers, including AT&T, eBay and yes, J. C. Penney. The company, this document said, spent $2.46 million a month on paid Google search ads - the kind you see next to organic results. Is it possible that Google was willing to countenance an extensive black-hat campaign because it helped one of its larger advertisers? It's the sort of question that European Union officials are now studying in an investigation of possible antitrust abuses by Google. Investigators have been asking advertisers in Europe questions like this: "Please explain whether and, if yes, to what extent your advertising spending with Google has ever had an influence on your ranking in Google's natural search." And: "Has Google ever mentioned to you that increasing your advertising spending could improve your ranking in Google's natural search?" Asked if Penney received any breaks because of the money it has spent on ads, Mr. Cutts said, "I'll give a categorical denial." He then made an impassioned case for Google's commitment to separating the money side of the business from the search side. The former has zero influence on the latter, he said. "If you asked me for the names of five people in advertising engineering, I don't think I could give you the names," he said. "There is a very long history at Google of saying â€˜We are not going to worry about short-term revenue.' " He added: "We rely on the trust of our users. We realize the responsibility that we have to our users." True, JCPenney.com's showing in Google searches had declined slightly by Feb. 8, as the algorithm change began to take effect. In "comforter sets," Penney went from No. 1 to No. 7. In "sweater dresses," from No. 1 to No. 10. But the real damage to Penney's results began when Google started that "manual action." The decline can be charted: On Feb. 1, the average Penney position for 59 search terms was 1.3. MR. CUTTS said he did not plan to write about Penney's situation, as he did with BMW in 2006. Rarely, he explained, does he single out a company publicly, because Google's goal is to preserve the integrity of results, not to embarrass people. "But just because we don't talk about it," he said, "doesn't mean we won't take strong action."